Is it sad? Is it hurt? Does it thinks it cannot do something? We knows what it is like. When Baggins stole my Precious we were sad, very sad. We thought we would never see our Precious ever again. But we did! We did, we did, we did! Heeheehee! To find our Precious, we traveled very, very far. Through the Mountains, and Mirkwood, and Emyn Muil, and even into Mordor. Under the watch of the Eye. The Eye is always watching! Poor Smeagol was very afraid, but we kept going, sneaking, hiding. So when it is sad, just remember that it can do it! It can, precious! Even if it is scared. It can go to many places, and do many things, and get what it wants! Smeagol knows. Smeagol did it, and we know it can do it too! It sent us questions! We only wants to talk about advice today, so we takes two questions and answers others later. What is the best way to catch fissh? It should find a pool or river. Lots of fish. And it can cool its feet so very nicely. Then it is patient. Smeagol is very patient. Watches for fishes. Then we grabs it out of the water! It must be very quick. Then it can eat the fish or Smeagol likes to hit it on a rock first. Then we eats it, my precioussss! What would you advise are the best parts out of the LOTR trilogy? We thinks it should skip the beginning with Bagginses. We doesn't like it one bit. 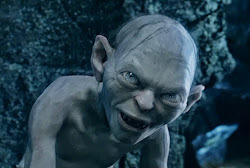 Smeagol's favorite parts are when nice Master follows us, and we catch fishes, and fights the fat hobbit, and gets our Precious! That is our advice - it shouldn't watch the parts with nasty, tricksey hobbitses. But we have good parts, very good parts! Will need to think of some more questions. It is very welcome, precious! Heeheehee! It likes it? It will follow our good advice, yes? Yes precious, it should. We wants to answer more questions, but the short blogger, always sleeping, reading, tumbling. We hopes to post our answers soon! Great answers Gollum and thanks for answering my question! Now I can go catch fish like Gollum. By the way, sorry I did not comment sooner, I never saw it on my dashboard. Mmm, we doesn't like the dashboard. Always missing what Smeagol wants to see.